The Saalt Cup and the Blossom Cup are both relative newcomers to the menstrual cup world. The Blossom Cup has been around a few years while the Saalt Cup came onto the scene a few months ago. Both of them are top-quality menstrual cups that have some initial great reviews from users. Both of them are made in the USA from medical grade silicone. The best thing is that both of these menstrual cups can often be found for a bit cheaper than some of the more expensive cups like the Diva Cup, Mooncup, or Lunette. Keep on reading for some more details about each of these menstrual cups, where to buy them, as well as our recommendation for which one is right for you. The Saalt Cup has just come onto the scene in the past couple of months and it’s quickly becoming one of the more popular menstrual cups. It’s made in the USA from medical grade silicone and has some initial, excellent reviews from users. The company is innovative, and committed to helping women in need around the world. They’re partnered with various organizations to achieve this goal. Most people really love the firmness of this stuff. It’s stiff enough that it’s easy to insert, but it’s also thin and pliable and you won’t be able to feel it when it’s inside of you. The Saalt Menstrual Cup achieves a nice balance between these two extremes and most people should be pretty happy with it. Like the Blossom Cup, the Saalt Cup has a money-back guarantee. In this case, it’s 2-cycles. Try out the Saalt Menstrual Cup for 60 days, and if you don’t like it, return it for a full refund. The Blossom Cup is one of the more affordable, yet still top-quality menstrual cups on the market today. Over on Amazon, there are thousands of happy customers with 4 and 5 star reviews. In terms of sizing, both the small and large Blossom Cups are a bit smaller than other menstrual cups. This can make it a nice choice for small-framed people, teenagers or those who’ve never given birth vaginally. One of the best things about the Blossom Cup is that it comes with a 90-day money-back guarantee. If you’re looking to try your first menstrual cup, then consider this one for this reason. But, the vast majority of people love it and never take advantage of this offer. In terms of sizing, both the Saalt Cup and the Blossom Cup are quite similar. The capacity of the Saalt Cup is slightly higher, but it’s not really a factor when deciding between the two. The diameters of the small, and large of each cup are within a millimetre of each other. Finally, the one thing that is slightly different between the two cups is the length. The small and large Saalt Cups both come in at 70 ml, while the Blossom Cup is 62 mm (small) and 65 mm (large). This can make the Saalt Cup a slightly better choice for someone with a higher cervix. The small Blossom Cup is a decent choice if you have a medium cervix height. 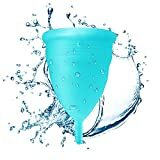 However, if you have a short vaginal canal, neither of these cups is a great option and you should stick with a low-cervix menstrual cup like the FemmyCycyle Low Cervix. The Blossom Cup vs Saalt Cup: Which one is the winner? Both of them are top-quality menstrual cups and make a nice option for most people. They are very similar in terms of sizing, and design. We love that both of them come with a money-back guarantee. There are a few differences that may be the deciding factor for you. The first one is price. In general, the Blossom Cup is around half the price of the Saalt Cup. However, the Saalt Cup is a higher-quality cup that might work better for you. The Blossom Cup is a bit stiffer, which some people find uncomfortable. The Saalt Cup is soft enough so that most people will find it very comfortable. However, it’s stiff enough that most people find it easy to insert. Overall? We’d recommend spending a bit more money and sticking with the Saalt Cup. In our opinion, it’s just a higher quality cup. Saalt Cup vs Blossom Cup: what’s your top choice? Leave a comment below and let us know your thoughts.